This is too interesting not to share. Remember the 4-car Type 4? Well in response to that, here’s an old video that shows a 4-car Type 1 train, courtesy of mrksvideos, who recently left this in a comment on that old post. Since I don’t expect people to go back and skim old posts for new comments (though there are some good ones! ), I wanted to repost this here so that you all could see it. This is a train move that hasn’t been done for 20(ish) years. In addition to that, I really like this because it’s rare to see video of MAX during the wheelchair lift, pre-low-floor car era. Really glad mrksvideos recorded it and posted it. 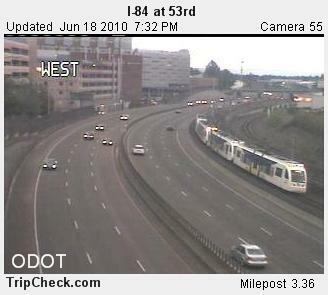 Back in the day Tri-Met ran Light Rail (MAX) to the far end of the line in Gresham, and had a few 2 car trains terminate there. The trains would pull down to the tail track at Cleveland Avenue and park there. Then, another train whose day ended there as well would pull down to the parked 2 car train and couple up. They would then take the 4 car train to Ruby Junction for the night and tie up. This practice ended a long time ago and I have seen no other record of this type of move anywhere. This video was shot at the west end of the westbound platform of Gresham City Hall station sometime in the 1990’s when the old Gresham lumber mill was still around across the tracks in the dark. Enjoy! 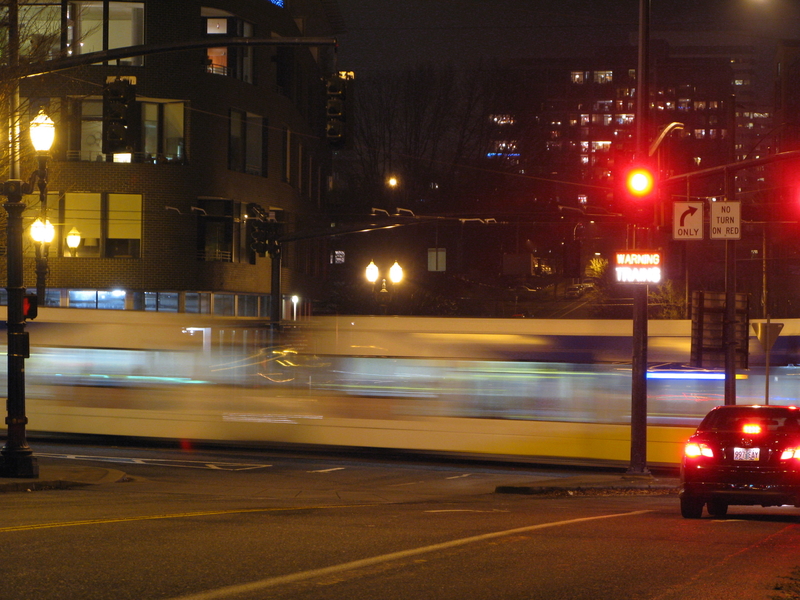 Over at Portland Transport, EngineerScotty (also author of the Dead Horse Times) posted on improving transit speed downtown, particularly for MAX. It’s an interesting post and a lot of different ideas have come up in the comments. I was going to respond there but it got long, so I’m taking it here and breaking up my thoughts on the different suggestions that have been made. 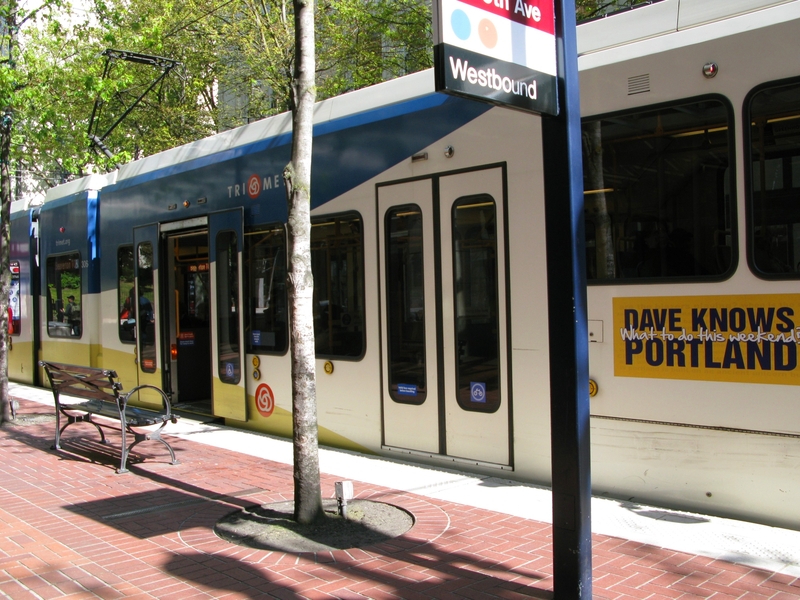 One of the constraints of MAX brought up in the post is train length – Portland city blocks are about 200 feet, and a two-car consist is about 184 feet (191 feet if it’s a Type 4). 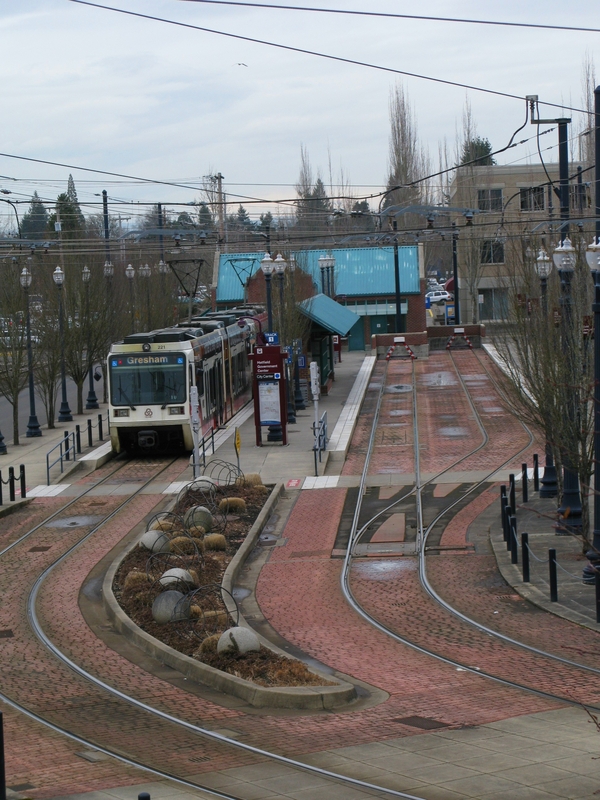 All lines run through downtown, so the system is designed around that 200′ maximum length for trains. Early on in the thread, one commenter asked why we couldn’t run a train that’s twice as long (a four-car consist rather than the two-car consists run now) – even if it blocked a street while it serviced a stop, it wouldn’t be there long and this would double the capacity of service. Mechanically speaking and not taking anything like platforms into consideration, the cars are capable of being coupled together in consists longer than a two-car train. I haven’t really posted about how cars are coupled aside from answering questions in comments, but the trains are coupled in two ways: a mechanical couple and an electrical couple. The mechanical couple is what physically holds the cars together; the electrical couple is what lets the cars talk to each other. 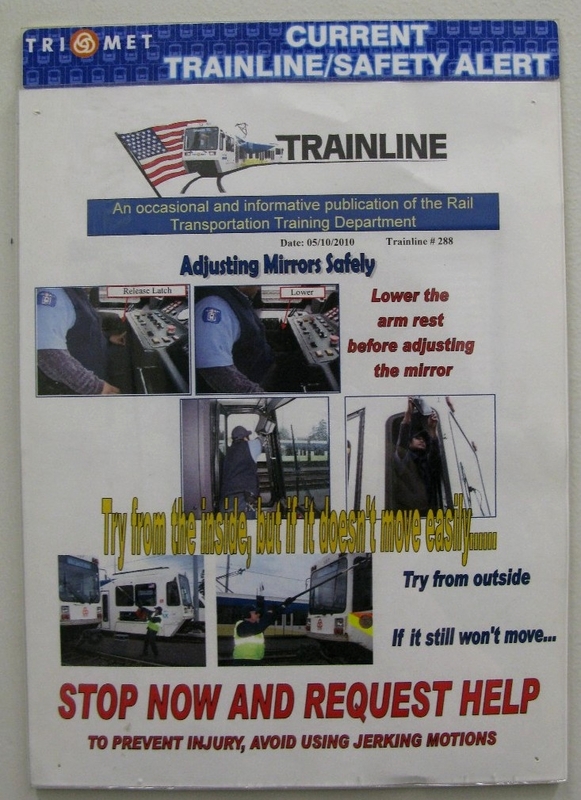 For example, this allows the operator to hit the door open button and have all the doors in the train open, not just the doors in the car that the operator is sitting in (this is called “trainlined” and yes, that’s where the safety communication gets its name). That works if there are two cars coupled together, or three, or four. I don’t remember if more than four cars can be electronically trainlined. This does not work for Type 4s. The coupler head located under the cabs of those is there to be used for a dead car tow or push and is capable of being mechanically coupled to any car in the fleet, but there will be no electrical communication between them. So aside from the 4s, more than two cars could be coupled together and still function. However, there are a number of reasons why it would take so much money in construction costs to run 3-car or 4-car consists to the point where it’s just not worth it. There’s also the matter of what to do when the train gets to the end of the line. Here at Jackson St, which is currently the end of the line for Yellow and Green trains, the first and third tracks are big enough to accommodate a two-car train, but nothing larger. The circuits in the turnaround are only big enough for one two-car train. I took this picture from the leading car looking back toward the trailing car, and the last wheel axle of the trailing car is just past the insulated joint on the eastern entrance to the turnaround. And the center track can only accommodate a single car train, such as the mall shuttle. In short (pun not really intended), there’s no room for a train longer than two cars here. As Hatfield is now, there’s no room for a train longer than two cars – to lengthen the platforms would mean shutting down Main Street which runs behind the building there. 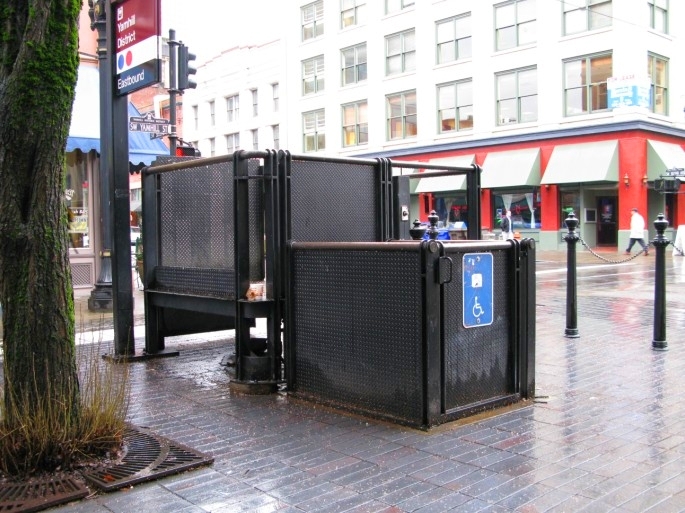 It’s not just a lack of space and platforms big enough to accommodate them that that make it impractical to run longer consists. Paradoxically, longer trains would actually mean slower running speeds in many sections of the alignments. 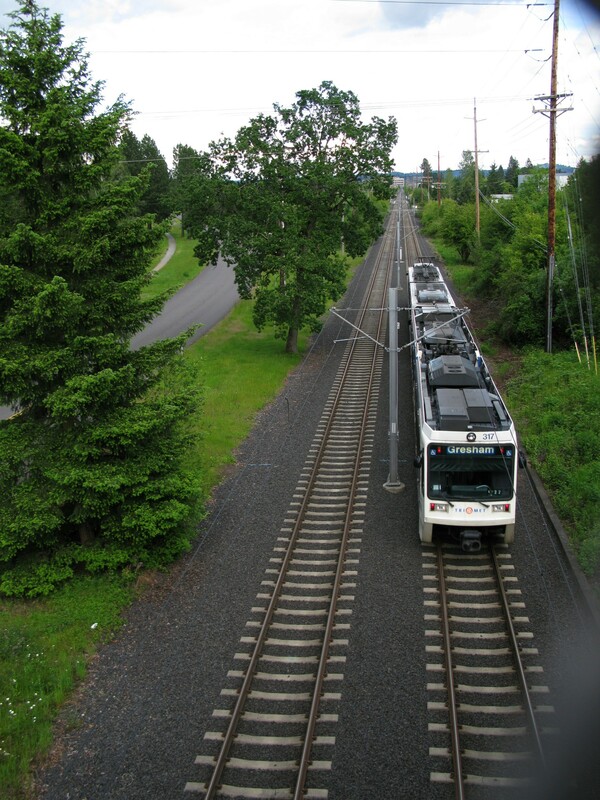 At Goose Hollow (above), for example, the speed limit around that curve for eastbound trains is 10mph, and a train can’t accelerate until the entire consist is clear of the curve. You get thrown around quite a bit if you’re near the back of a trailing car going around a curve and the operator accelerates before you’re out of the curve. If the trains were twice as long as they are now, that’s waiting until another 200′ of train has gotten through a curve before the train can accelerate. In other places, gravity would work against longer trains. For example, heading into the tunnel westbound, the speed limit is 55mph past the first cross passage. As things are now, if your train is a two car consist with a crush load of people, it’s hard to get to 55mph since you’re climbing a hill with all that weight. If you’ve got twice as many cars and people, it’ll run even slower. 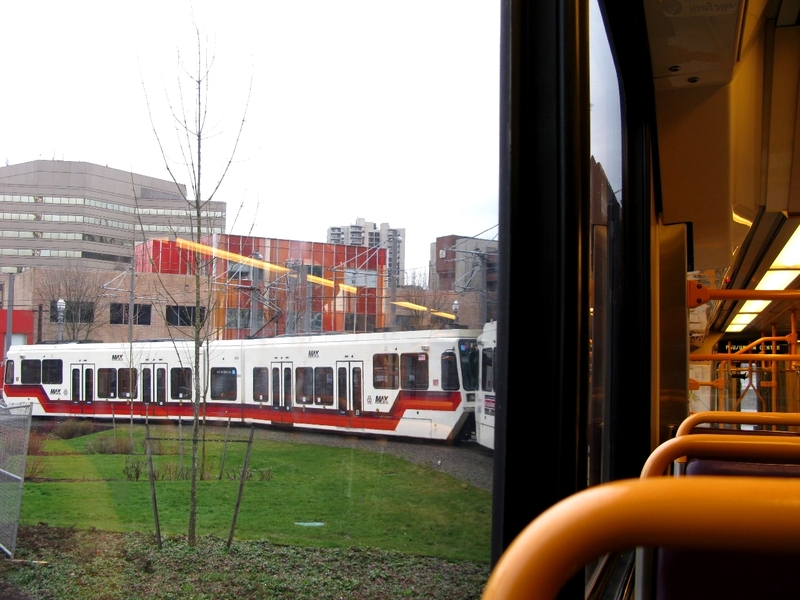 Longer trains might mean more capacity, but ultimately they’d mean slower running speeds. So it’s an interesting idea to run longer trains, but it would involve so much construction to existing platforms, major modifications to city blocks in the CBD, to say nothing of the work involved in changing the circuits in the rails to accommodate longer trains that it’s not feasible to do. Surprisingly, yesterday’s April Fools joke of a WES extravaganza took far longer to put together than I had anticipated, but taking it all down gave me the chance to make some style edits (both here and on my Twitter page) that I’ve been wanting to do for a while. Just getting tired of the old pics and theme, I guess. The WES post will stay up, but since I pretty much exhausted everything I knew and/or could find about WES in writing that, it’s unlikely there will be more WES content in the future. 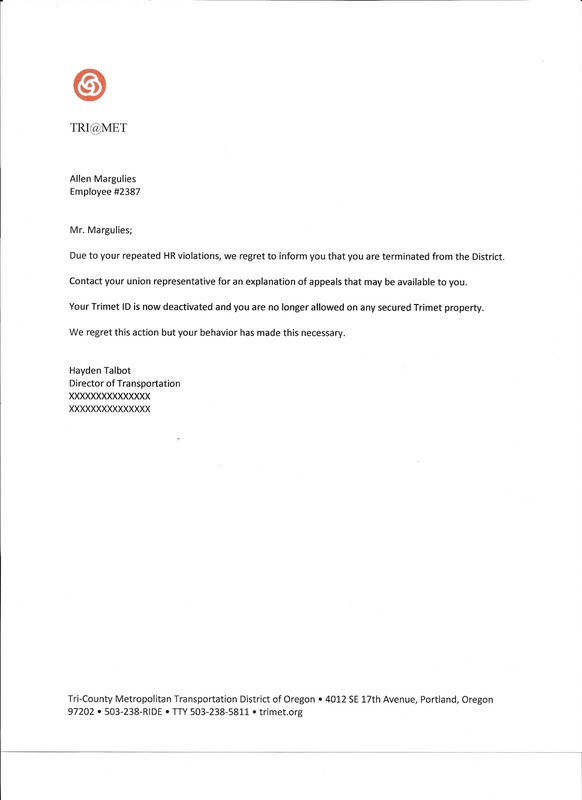 There were some great transit-related April Fools jokes yesterday – Portland Transport becoming Portland Trainspot with a mission of posting photos of TriMet rail vehicles; Isaac Laquedem’s post on TriMet’s expansion of rail to the north, east, and south (best line in the post “We are optimistic that the Department of Transportation will approve our request for a 95% matching grant to finance track and station improvements, new rolling stock, public art, and two more fare inspectors”); over at the Oregonian Joseph Rose’s post on how MAX bicycle hooks are now reserved for passengers’ dry cleaning; and the one that made me laugh the most, Al M’s termination letter from TriMet. Anyway, back in MAX-land here, you may have seen that I’ve added some new pages to the top header. If you’ve been reading for a while, most of that content isn’t new except for the “When is the last train?” page. I’ve noticed patterns in the things that people search for that land them here, and I want to make it as easy as possible for people to find the answers to what they’re looking for. The search function that WordPress provides (top of the right sidebar) is pretty thorough but sometimes yields an overwhelming amount of information, so I’m trying to make the setup here more approachable and easy to use by consolidating the links of posts related to those subjects into those pages. Any thoughts or suggestions of what else might make this site more user-friendly would be welcome. Welcome, people coming over from Dave Knows Portland! It’s pretty flattering to be listed in the Transit Blogroll of 2010 considering I had been reading Dave Knows Portland for a while before I entered the blog world. 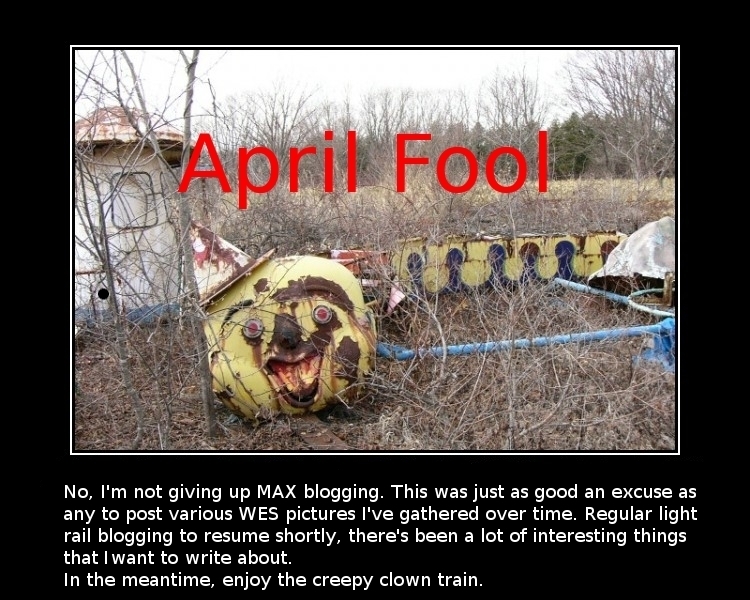 So back when I saw this train several months ago, I took a picture of it in a “hey, I know that blog!” kind of moment. It’s kind of nice to have an on-topic reason to post it. I want to ride a Type 4 – is there a specific time and place that one is guaranteed to pass through? 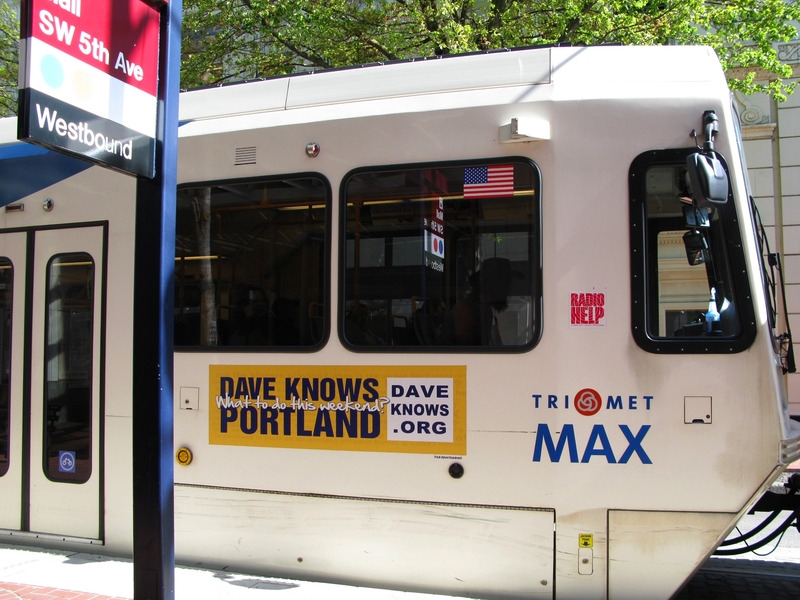 What about finding a particular car (like the Dave Knows Portland car)? Do operators pick what cars they take out in the morning? If an operator has a run that involves taking a train out of the yard, they’ll be given storage information that’s assigned from Control – it says which track and what space(s) their car(s) is(are) in. An operator doesn’t just walk out to the yard, find a set of cars they like and take those out. Control would not approve of that – they keep track of how the cars are stored in the yard. 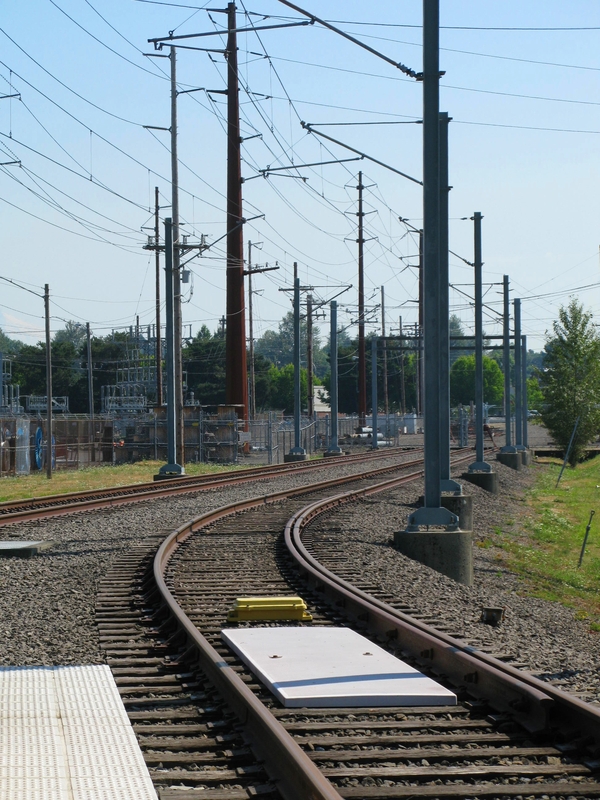 If an operator has a run that involves storing a train in the yard, they get their storage instructions from Control when they leave the mainline and enter the yard. So basically, you can’t really predict where any particular train or cars are going to be. Sometimes they’ll be used on the same run more than one day in a row, but it all depends on how they were stored and how the Controller makes the assignments to send them out. Even then, there are so many other factors that can interfere with train movement that there’s no way to tell for sure that a run is guaranteed to have a particular train car on it. Question: Can trains get flat tires? 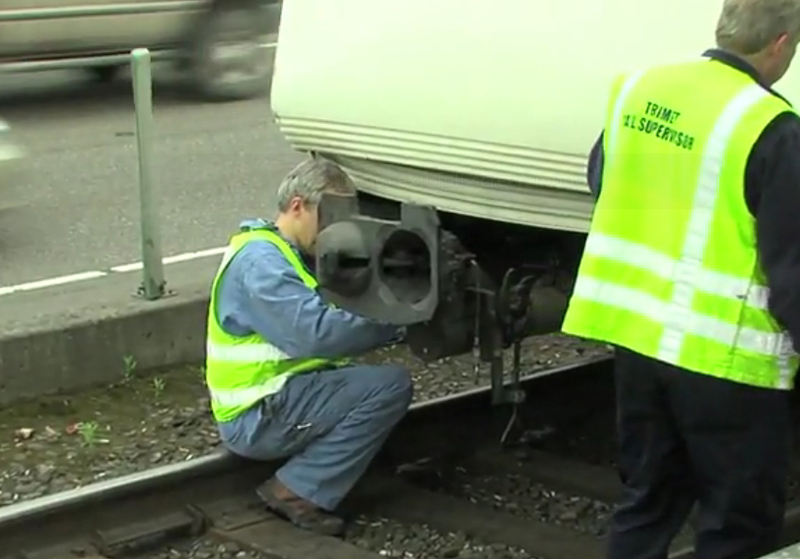 The trains should run pretty quietly – a “chugging” sound like that is indicative of a flat. 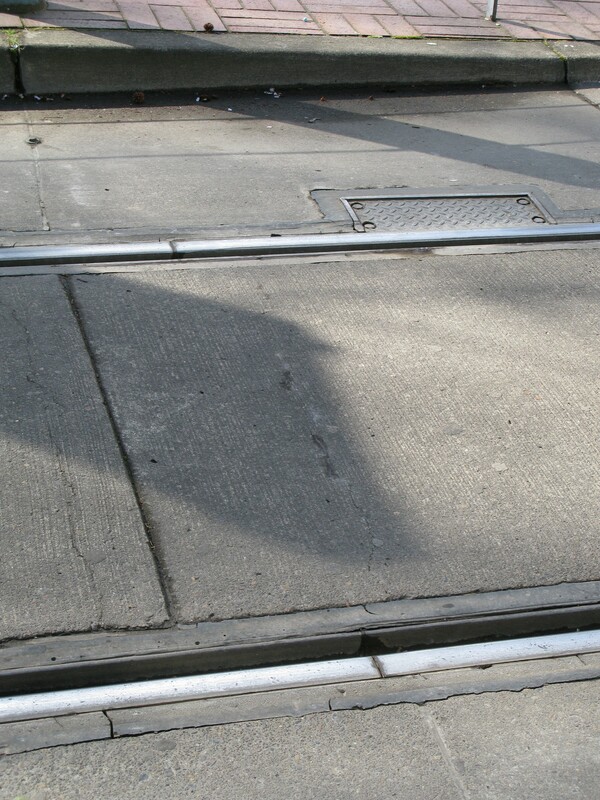 Flats can form on slippery rails or when the train makes a sudden hard stop, and bad flats on a train will get it pulled out of service so the wheels can be repaired.